I love shortcuts, anything that I can do to make my life easier, or some menial task less tedious while still achieving a high quality result is what I generally aim for. This is especially true when it comes to my workflow on my computer, I am a sucker for keyboard shortcuts. So it always surprises me and delights me when I learn about a new shortcut, especially one as simple as this. One of my methods for keeping on top of my Inbox is by attrition – once I reply/complete a message I move it into a sub-folder so it is visually out of the way. I am definitely a keyboard jockey, and if possible would prefer to never have to lift my hands from the keyboard to use a mouse, so dragging and dropping a lot of emails gets clumsy after a while. To quickly move a message to a different folder in Outlook, have a message selected in your Inbox, then hit the key combination Ctrl + Shift + V (I do this with my left hand pinky + ring finger + index finger), and a windows will pop-up where you can use your arrow keys to select the folder, then hit Enter to finalize the message destination. Some people are less keyboard-coordinated so this shortcut won’t work for everyone. 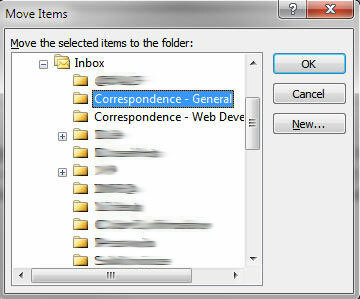 But I find it much easier than dragging and dropping and possibly sending my message to the wrong folder.